It's not the horsepower figure that bothers me. It's that it's getting that 155 hp from a 2.0-liter engine, and these days, 155 hp from a 2.0-liter four-cylinder in a sporting application is pretty lackluster. I know specific output isn't everything. That's not the point. The point is power-delivery characteristics. How does that engine feel putting those 155 ponies to the ground? I've owned my early, 1.6-liter NA Miata for a little more than 6 years now, and while I've always loved the chassis, the engine never felt like a great match for the car. It's not that it feels utterly lacking in power. But having come from Hondas, the B6 in my Miata just feels ... not very special. And it's not. It's a repurposed 323 engine. The biggest disappointment is that it doesn't reward you for taking it up to the redline. Early Miatas had a lot of parts-bin engineering under the hood. Now that's not always a bad thing, but those B6 engines were fitted with an airflow meter that was too small for the airflow demands of even a stock engine. They run out of breath at around 6,300 RPM and become thrashy and lethargic-feeling. The later 1.8s were better, using a mass air sensor that could accommodate the airflow needs of the engine, but they still don't sing at the top end. Those engines, both the B6 and BP, were heavy, too, with cast-iron blocks. So what you had was a motor that weighed more than it needed to, and was better suited to the needs of a small sedan than a sporty car. Now I know that classic sports cars often had engines that were shared with small commuter cars. The small fours in MGs, Sprites, even the six in a big Healey, were engines designed for more pedestrian applications. 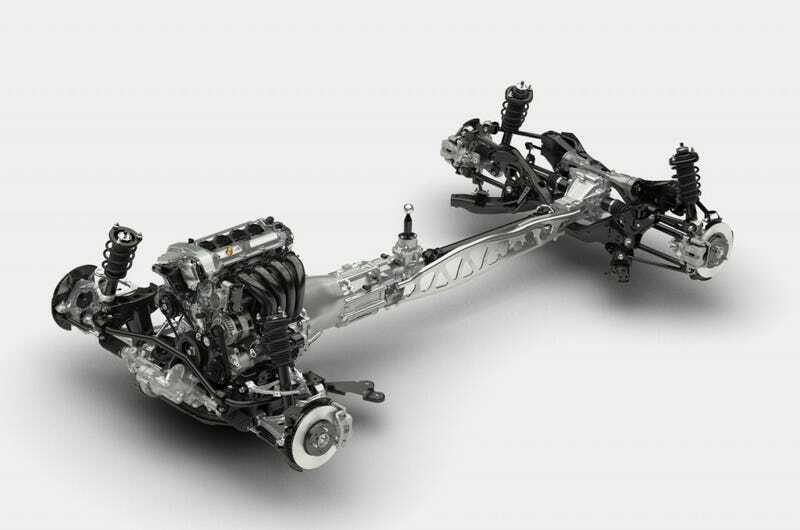 But it's also true that nothing suits a high-revving, small-displacement engine like a lightweight chassis with great suspension. I've always thought that what the Miata really needed was something like a Honda B16A. Not a huge powerhouse of an engine, but something free-breathing and rev-happy that lives in the upper range of the tach, and is relatively light and compact. An engine like that would suit the character of the car very well. But this Skyactiv 2.0 sounds like it's still tuned for a small sedan, like the Mazda 3. The Miata, being a much lighter car, doesn't need so much punch in the midrange. It needs an engine that, much like the Miata chassis, begs to be wrung out at every opportunity. If Mazda were getting those 155 hp from a high-strung 1.6 liter, I'd be pretty stoked. But from a 2.0 liter, I suspect the power delivery is going to be all too much like that of my old 1.6-liter NA: decent in the midrange, but disappointing at the top end. Baruth brings up the issue of weight as it relates to increased power, saying that a higher output figure would require several beefier components, such as 5-lug hubs. I don't necessarily agree, at least to the extent he makes it out to, considering that Flyin' Miata doesn't seem to think their 480-hp LS376 conversions need an upgrade to five lugs. But it does bring up the issue of the weight of the engine. Since you don't really need 2.0 liters to make 155 hp these days, why use a bigger, heavier engine than the output target demands? Wouldn't a 1.6 liter engine of the same power save weight? I don't mind the idea of a 155-hp ND Miata. It's the idea of a 2.0-liter engine in a car like the Miata making that power figure that I'm not absolutely thrilled about. Then again, the Miata is typically such a great chassis, concerns about the engine usually don't ruin the driving experience. And I do expect the ND will continue that tradition.